WASHINGTON — While Washington, D.C. may be shrouded in partisan discord, the Beach Boys will be bringing good vibrations to the West lawn of the U.S. Capitol on Wednesday. The surf rock legends are scheduled to perform at the Capitol Fourth, an annual concert hosted by PBS to celebrate Independence Day. In addition to the show, PBS will be presenting them with The National Artistic Achievement award, an honor that has previously only gone to a handful of others, including musician Stevie Wonder, composer John Williams and singers Reba McEntire and Gloria Estefan. It’s a level of recognition that shouldn’t be surprising for a universally acclaimed band well into their fifth decade of making music, but one that eluded them on a fateful Fourth of July over 30 years ago. 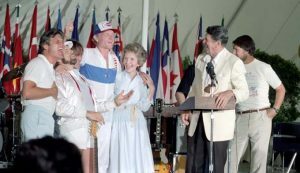 I caught up with Beach Boys co-founder Mike Love, who happily dished about a 1983 incident in which then-Interior Secretary James Watt banned all rock acts from playing that year’s Independence Day concert, including Love’s band. Indeed, Watt said at the time that rock bands attracted “the wrong element,” apparently unaware of the Beach Boy’s image of all-American wholesomeness. The ban didn’t last long, nor did it sit well with their fans. While the controversy prevented the Beach Boys from playing that year’s concert, Love looks back on it with an air of amusement. “Irrespective of what James Watt thought, that brought to our awareness just how loved the Beach Boys music has been to so many millions of people over the years, and not only the U.S., all around the world as well,” Love said. As for this year, Love is looking forward to yet another fun evening in the nation’s capital. Not only will the Beach Boys be joined by stars like yacht rock mainstay Jimmy Buffett, vocal group the Pentatonix and actor John Stamos (Himself a Beach Boys super-fan and their occasional drummer), but the group will also be backed by the National Symphony Orchestra. “There are certain songs like God Only Knows and California Girls and Wouldn’t it be nice that … sound phenomenal with the orchestral arrangements,” Love said, noting that the group will be hitting the road this summer with an orchestra behind them. 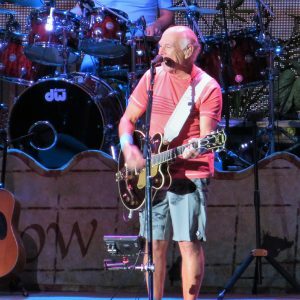 Love also hinted that Wednesday’s concert could come with some surprises, including a possible duet with Buffett on Kokomo, one of the Beach Boy’s tropical-themed hits. The concert, scheduled to take place from 8 p.m.-9:30 p.m. EST, is free and open to the public. It will also be aired live on PBS. ← Will driverless vehicles destroy auto insurance companies?